Trim the construction paper into three pieces and wrap each piece around a pack of Rolos and secure with tape. Hold onto the excess construction paper for now. Wrap the pieces of construction paper around each pack of Rolos and secure with a bit of tape. Gather the three packs of wrapped Rolos into a bunch and secure with a pipe cleaner. 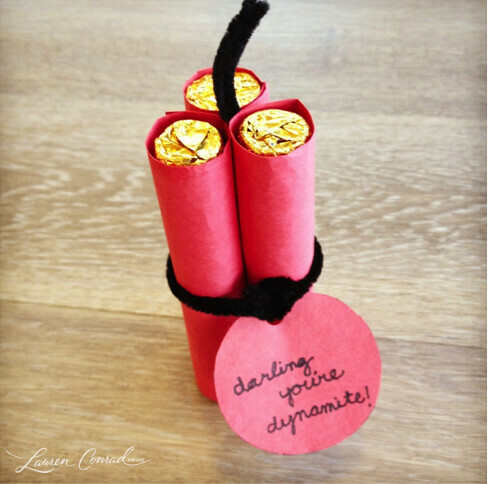 Using the excess construction paper from Step #1, make a tag with the message “Darling, you’re dynamite!” (Other message suggestions: “You’re a blast!” or “You’re the bomb!”) String the tag onto the pipe cleaner. Lastly, the second pipe cleaner in the middle of the three packs of Rolos, trimming off the end so that your “fuse” is an inch or two long. Isn’t this an adorable idea? Do you have a crafty Valentine idea? Share it in the comments below. Cupid’s Corner: Spare Kisses Anyone?